So… Handmines! (Doctor Who, Daleks, & Slaughterhouse Five) – Marc Schuster, etc. I just watched the season premiere of Doctor Who and was struck by the thing that probably struck all fans of Kurt Vonnegut’s Slaugherhouse Five: The Handmines are suspiciously similar to the Tralfamadorians. In case you haven’t seen the episode, Handmines are like landmines, but instead of blowing people up, they reach up from underground and drag people to their deaths. And, creepily, they look like hands. 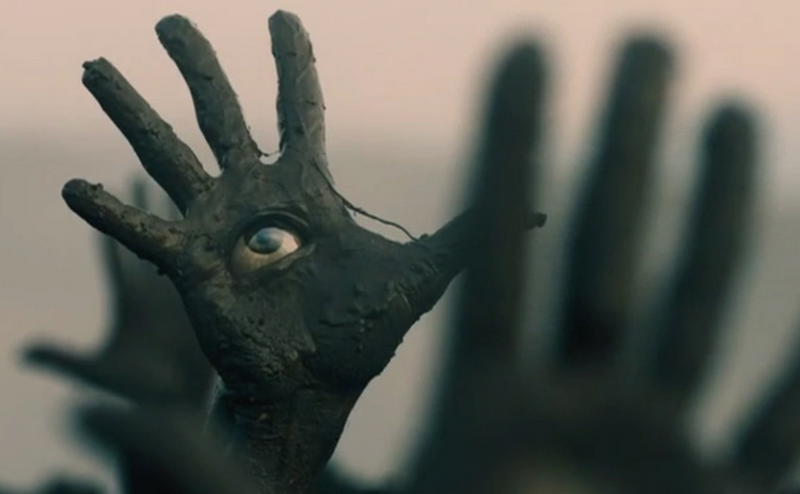 And, more creepily, each hand has an eye in its palm. A Handmine in action… like a Dalek, scary but oddly impractical as a weapon. The letter said that they were two feet high, and green, and shaped like plumber’s friends. Their suction cups were on the ground, and their shafts, which were extremely flexible, usually pointed to the sky. At the top of each shaft was a little hand with a green eye in its palm. Plumber’s friends! Which, of course, is to say plungers! Which is also to call to mind the ridiculous, iconic, and seemingly useless appendage mounted to the left of almost every Dalek’s gun! Assuming Steven Moffat, who wrote the episode, is paying tribute to Vonnegut in some way (and even if he denies it… really? 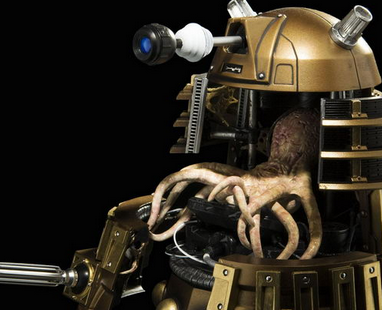 ), then when we’re looking at Handmines, we’re looking at the flipside of a Dalek’s trademark plunger. The real question the Handmines answer is why the Daleks look like Daleks. That is, why do they roll around when walking seems to be the superior alternative? After all, we know that they have the technology to take on any form and usually do so in an upright, bipedal fashion (as the shopworn plot device of having pretty much every side character turn out to be a Dalek in disguise demonstrates). In other words, they can walk. They just choose not to. If you’re Davros and you come from a planet where hands can reach up from the ground and grab you around the ankle and drag you to your death at any moment, you’re going to be particularly wary of the drawbacks of having ankles. As a result, any design you come up with for the ultimate survival machine isn’t going to have ankles. Instead, it’s going to have a massive base that rolls around on the ground so that a Handmine can’t reach up and conveniently grab it. More to the point, however, it’s hard not to think of other sea creatures that might be living in tanks. Octopi and squid, for example. And their doppelgangers, the Kaled mutants who operate the Daleks. A Kaled mutant rolls down the windows of his Dalek to get a bit of fresh air. If there’s a parallel to be drawn here, it’s one I’ve made elsewhere, so forgive me for beating this dead horse: We have met the Daleks and the Daleks are us. But the image of the tank also underscores a theme shared by Slaughterhouse Five and pretty much every episode of Doctor Who featuring the Daleks. That is, war isn’t just bad; it’s dehumanizing. It causes people to arm themselves, to shield themselves inside protective layers of armor that prevent their feet from touching the ground. And these layers of armor aren’t always literal. They can consist of stories we tell ourselves about ourselves and how the world works (“We’re good, and they’re bad!” “We’re survivors!” “You need to kill or be killed!”). Moreover, these stories we tell ourselves can take away our compassion — which turns out to be the main theme of the episode. It’s easy to show compassion for our friends since, by definition, they’re part of our understanding of who the “good guys” are. It’s harder to show compassion for our enemies or those we consider “other” or “alien.” Hence the Doctor’s on-again, off-again uneasy alliances with Missy/the Master, but his general tendency to always be aligned against the patently alien Daleks. But as the season premiere of Doctor Who and Slaughterhouse Five both suggest, without compassion, none of these alliances mean much of anything at all. Wow, how had I missed this post?! It makes me wonder what other posts of yours I’ve missed, Marc (and I have wondered why I hadn’t heard much out of you…)! WP must be again mucking with their code and it’s screwing with my subscriptions?! I seem to get some of your posts but not others…. Methinks strange things are afoot. Things may well be afoot… Or at least ahand. Thanks! I’m glad you found my post interesting!